Starting his tradition around the beginning of his second year of teaching in 2006, McCarthy who previously taught in San Diego, uses a talk show styled interview with one of his students in both his 9th and 10th grade classes, creating a personalized and signed certificate for the student of the week and asks a variety of questions submitted by himself and the class regarding personal preferences, school, and world issues. He was first inspired to adopt this weekly feature during a flight from Sacramento to San Diego where a retired history teacher from Oak Ridge High struck up a flight-long conversation. The Oakridge teacher persuaded McCarthy to try his Student of the week model as the plane was reaching its descent. When he first implemented Student of the Week in his classes, it got off to a rocky start, but it was the interest and excitement his students had for the weekly celebration that motivated him to continue doing Student of the Week. 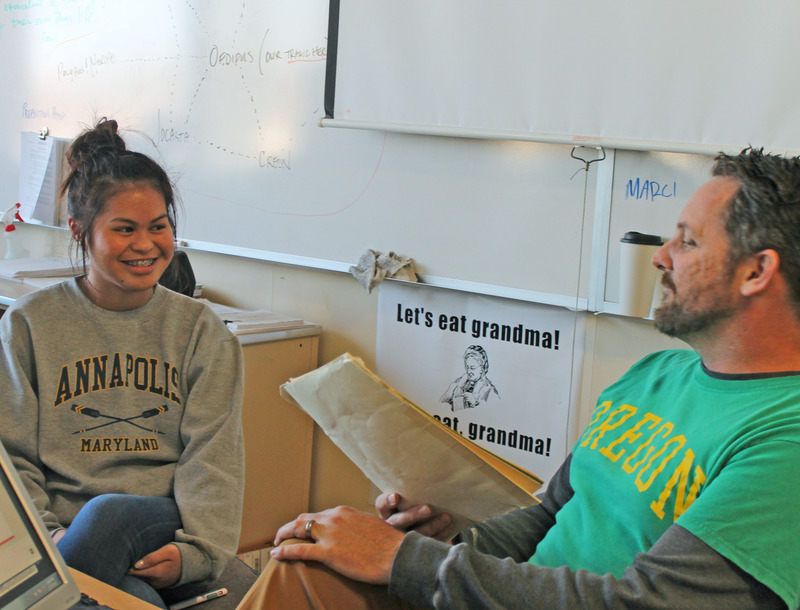 “It gives you an opportunity to know more about the students, instead of just sitting in class with them,” spoke Senior Madie Nishimi. Years later, McCarthy still continues to bring Student of the Week to his pupils, and he has no plans of ending this in the future. The memories his students hold is what helps drive him to do this, to have his students graduate high school, and still ask McCarthy if he hasn’t yet ended his weekly tradition. “I like it, it’s a little bit repetitive for me, but I would never in the world stop doing it, because it is the only thing that kids ask me about after they leave here.” McCarthy shared. When asked whether or not other teachers should adopt a similar feature to that of Student of the Week he responded, “The fundamental quality of this is not the actual format. It’s the idea behind celebrating kids, recognizing them for being part of the class, not necessarily recognizing them for being a teacher’s pet or being the best, but just the fact that they’re important because they’re here. They’re part of our class, and they’re part of our school, and they’re a person. And that’s utterly important, always.” “I feel like Student of the Week makes everyone feel like they belong, and are beneficial to the class” profesed Senior Jade Jones.